Happy meal prep Sunday! Here’s a marinara sauce I made for a veggie lasagna (recipe coming soon!). I decided to make my own because it’s quick, delicious and budget-friendly. I never realized most tomato sauces have sugar as one of the first few ingredients, since sugar brings out the flavor in tomatoes; sometimes those sauces are just too sweet then. It’s hard to find a sauce without any added sugar (Whole Foods’ 365 brand does have a great one). This Basil Marinara Sauce is so easy and literally ready in 20 minutes — plus you get the satisfaction of it being homemade and making it from scratch. With only 5 ingredients, there’s no added sugar or salt, while still bursting with flavor. I told you I had big plans for those coconut flakes. 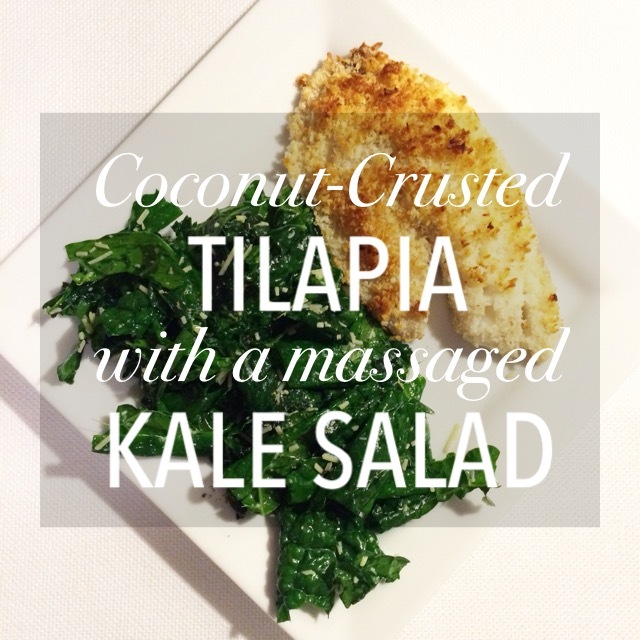 I give you Coconut-Crusted Tilapia with a Massaged Kale Salad. I completed the meal with some Coconut Banana Cookies. I also think this would be quite delish with half a sweet potato or a gnarly piece of multigrain bread. For anyone with gluten-free needs, you could easily use gluten-free panko. Another great option to get your weekly dose of seafood or to bypass any meat on Fridays during Lent. The coconut flakes add a subtle flavor and pungent Parmesan cheese and earthy green kale balance the mild fish. Don’t worry dinner — I’ve got you covered.